AXANAR fan comic COMPLETES part one of “Arcanis IV”! The latest comic book story based on the fan film PRELUDE TO AXANAR has just completed part one of its first chapter. 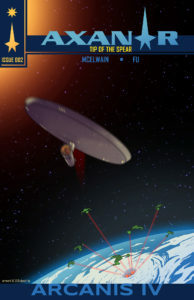 Last July, Axanar super-fan TREY McELWAIN released the first-ever Axanar comic story: the four-page (including cover) “Trial By Fire.” It was a huge hit among Axanar fans, many of whom hoped to be seeing more similar projects from Trey and his illustrator, DANIEL FU. The wait lasted for ten months. In May, Trey continued what he called the “Tip of the Spear” saga, with each chapter focusing on a different battle from The Four Years War with the Klingons, as shown in Prelude. But now the comics would expand from just a few pages to stories with chapters, each about 5-7 pages long. The first story took a closer look at the battle that began the Four Years War at “Arcanis IV.” Trey initially released the cover and first two pages of the story, with the intention of releasing one additional page per month for the foreseeable future. Part one of “Arcanis IV” would be seven pages, and there would be three parts. Then the next chapter would be “Inverness V,” also divided into multiple parts. So releasing one new comic story page per month could keep this going for years! That’s the good news. Unfortunately, it could be a while before fans see part two. Author Jonathan LanePosted on July 13, 2018 July 13, 2018 Categories Fan Film Features, NewsTags Arcanis IV, Axanar, Comic Book, Daniel Fu, Trey McElwain, Trial By Fire3 Comments on AXANAR fan comic COMPLETES part one of “Arcanis IV”! 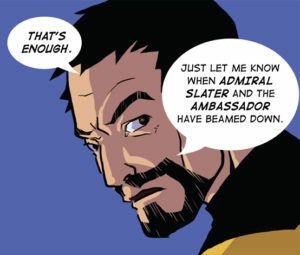 New AXANAR fan comic released! Last July, AXANAR super-fan TREY McELWAIN released the four-page (including cover) “Trial By Fire,” the first-ever comic story based on the hugely-popular Prelude to Axanar Star Trek fan film. Trey wrote the comic and his friend DANIEL FU illustrated the story, which looked at a space battle during the Four Years War with the Klingon Empire. 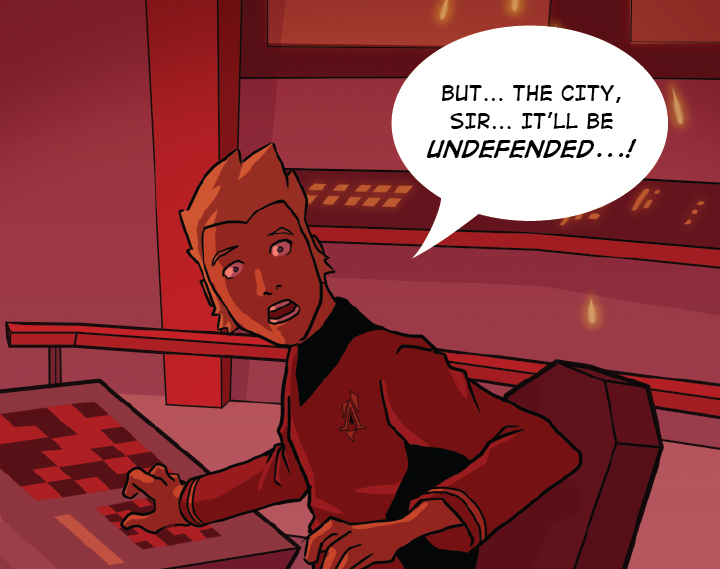 Now, Trey and Daniel offer the first glimpse of their second Axanar fan comic: “Arcanis IV,” which looks at the Klingon sneak attack that launched the long and bloody conflict. Unlike their first comic, where the three story pages were released all at once, this time Trey and Daniel are releasing the pages as they are completed, about once a month. Bear witness to the very first attack of the “Four Years War”! 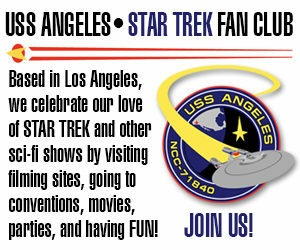 An unsuspecting Starfleet caught off guard by a relentless and formidable foe! 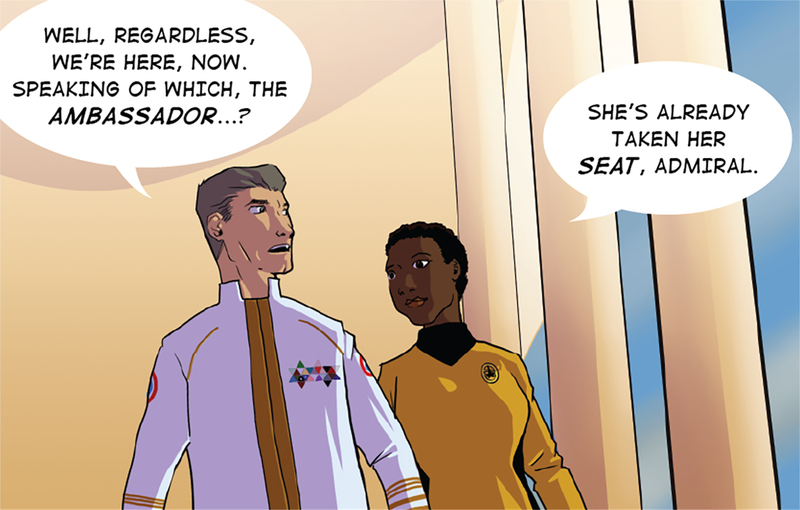 Each month, a new page will be presented to continue with the story of “Arcanis IV,” highlighting scenes from “those that didn’t make it back” and the choices and sacrifices Admiral Slater had to make during those first 2 years before Ramirez took command of the fleet. Then after that, a new comic to continue with the story arc of the “Four Years War,” with cover and pages being presented each and every month (one page per month). 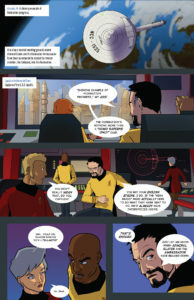 For the HI-DEF versions of these most incredible pieces, make sure you go to the Axanar Comics Website to find them! Author Jonathan LanePosted on May 4, 2018 Categories Fan Film Features, NewsTags Arcanis IV, Axanar, Comic Book, Daniel Fu, Trey McElwain, Trial By Fire1 Comment on New AXANAR fan comic released!